How can you prevent them and are there DIY treatments? Raise your hand if you remember going to Claire’s to get your ears pierced for the first time. This adolescent rite of passage was pretty darn exhilarating — until it inevitably resulted in your first earring hole infection. Although you’re older and wiser now, you’re definitely not immune to the occasional pierced ear infection. But you can avoid them with the help of a few simple tricks. We spoke to experts to understand everything from the warning signs and causes of an earring hole infection to dissecting the various at-home treatments available. Preventing earring hole infections all starts with proper hygiene — both right after a piercing, and for years to come. If you recently got a piercing, make sure to wash hands thoroughly before touching the piercings to avoid exposing the area to any unwanted bacteria. “Piercings should also be soaked twice a day for two to five minutes with a saline or salt solution. A soaked, clean gauze can be used to gently clean the area,” said cosmetic dermatologist Sejal Shah, founder of SmarterSkin Dermatology in New York City. If your piercing is fully healed, make sure to clean both the earrings and piercing site whenever you remove your jewelry. Keep earrings clean by wiping them down with an antiseptic cleanser (such as alcohol), Purell, soap and water or even mouthwash in a pinch. And do so often (at least once a week) because buildup of any sort in your earrings can spell trouble. “Dead skin can build up around the backing as a result of dandruff or infrequent removal and serve as a nidus for germs,” said Dr. Francesca Fusco of Wexler Dermatology in New York City. If you’ve never had an earring hole infection before, you may not be familiar with the warning signs and symptoms, but they’re pretty straightforward. Warm, itchy, tender ears are a telltale sign of an infection, and your ears will also likely look red and a bit swollen. “This usually would be accompanied by some sort of cut or scab on the ear, but not always,” said Dr. Joshua Zeichner, director of cosmetic and clinical research at Mount Sinai Hospital's department of dermatology. Some earring hole infections may also be accompanied by an oozy discharge, but not all ear discharge is cause for alarm. In fact, ears sometimes secrete a white to yellow thin liquid while healing from a piercing, and sebum from your oil glands can also collect on your piercings. “If your discharge is light in color and not accompanied by pain, redness, warmth or swelling, it is probably not infected,” Shah said. An easy way to self-diagnose your infection? Fusco encourages patients to think of "the four Ps": pain, pus, plumpness and (deep) pinkness. “All indicate possible infection,” she said. The good news? Minor earring hole infections will typically only last a few days, and you can usually nip them in the bud with a few home remedies. If your situation doesn’t improve in a few days, though, you may need to call in backup. “Untreated infection could lead to more complicated infections that require drainage and oral antibiotics,” Fusco said. What causes a pierced ear infection? Whether you just got your ears pierced or are a piercing veteran, there are a number of reasons you might end up with an earring hole infection. Fresh piercings, especially, are pretty vulnerable, and can actually take up to six weeks to heal. 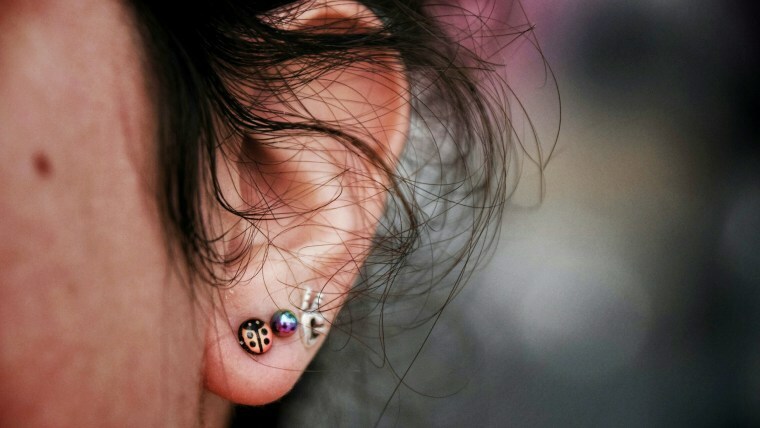 “An earlobe piercing is essentially an open wound until it fully heals, so during this time, like any other wound, it is susceptible to infection,” Shah said. That means simple acts like handling your earrings with dirty hands or forgetting to clean them can accidentally introduce unwanted bacteria into your earring hole. “When bacteria gets trapped in the piercing hole, it can have a hard time finding its way out. It can then multiply and create an infection,” said dermatologist Marina Peredo. Once your piercing heals fully, it’s less likely to get infected, but that doesn’t mean you’re totally in the clear. You still need to clean your earrings frequently to prevent an infection. “Earrings can accumulate buildup from soap and shampoo, and sometimes hair products. It’s a good idea to clean your earrings once a week,” Peredo said. Taking your earrings out every night will give your ears a much-needed break, and you should also sanitize them before sharing them with friends or before trying on a new pair at the mall. If you take good care of your earrings but still end up with an earring hole infection, the type of earrings you’re wearing could be to blame. “Allergic reactions to jewelry are generally due to metal allergies, most commonly nickel but also cobalt and gold,” Shah said. “It can be very difficult to determine whether a piece of jewelry contains nickel just by looking at it. One should assume all-metal jewelry has some amount of nickel unless it is made of stainless (surgical) steel or pure platinum.” Sterling silver and 24-karat gold are usually safe bets, too. Costume jewelry, in particular, can be problematic for certain women. “The metal used in costume (jewelry) is more reactive than precious metals and more likely to cause irritations to the earhole,” said Elizabeth Doyle, co-founder of jewelry brand Doyle & Doyle. You don’t necessarily have to run to the doctor at the first signs of an ear infection. In fact, there are several do-it-yourself treatments you can explore to help treat it before seeking additional assistance. Take dandruff shampoo, for instance. “The zinc pyrithione in dandruff shampoo is known to treat dandruff but also has antibacterial properties that can aid in the healing process of infected ears or work to prevent infection,” Fusco said. If your ear irritation seems more like an allergic reaction than a full-blown infection, Shah suggests removing the earring, then using a gentle cleanser to cleanse the ear twice a day. You can also try applying an over-the-counter hydrocortisone cream and a healing ointment such as Aquaphor or Cicalfate. With blatant infections, cleaning the infected area with a saltwater rinse (after washing your hands, of course!) and steering clear of certain irritants can also help cure it. “Avoid alcohol and hydrogen peroxide as these can potentially irritate the areas. Dry the piercing on both sides with a paper towel. If the infection is improving, continue this until fully cleared,” Shah said. If the infected area is oozing, try placing a towel on your pillowcase and changing it daily. Then once it subsides, apply an antibacterial cream to the earring post before inserting it. “I advise trying home treatments for about a week. If home treatments are not working or the area is worsening, it's best to seek medical care immediately,” Shah said. Most dermatologists will suggest a prescription-strength antibacterial cream like Biafine or mupirocin, and if the hole is very oozy with pus, some may even culture the infection to identify whether it’s bacteria or yeast. The good news? Earring hole infections aren’t the worst thing that can happen to you, and as long as you treat your ears — and earrings — with care, you can make sure you never deal with a pierced ear infection again!